Its unique design eliminates bending to water your tree, as well as the guesswork as to whether or not it needs watering. 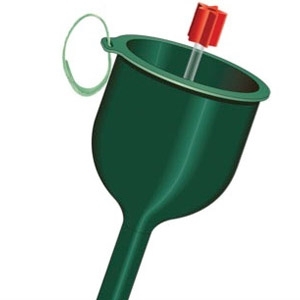 It is basically a long funnel which allows you to water your tree from an standing position and eliminates bending and crawling under the tree. The handy dipstick works like a straw and allows you to put finger over the top and trap water in the tube so you can see when you need to add more water. By Keystone Products.